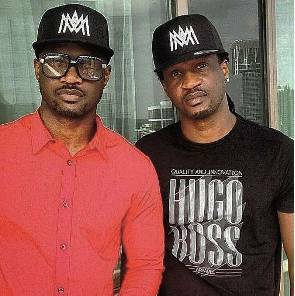 When twin brothers and singers, Peter and Paul Okoye of P-Square, were ‘threatening’ to go their separate ways some months back, a lot of reasons were adduced for their ‘bizarre’ action. Some believed that the brothers were truly at each other’s jugulars, and that their elder brother, Jude, was taking sides. Meanwhile, others attributed it to a publicity stunt. Even though they seem to have hugged and made-up, the duo unwittingly, let it slip that their fight may have been stage-managed after all. It was at the AFRIMA event, and the singers were on stage to close the show with their performance. Halfway through their performance, the twins stopped and decided to engage in chit-chat with the audience.